This version of Runeblade uses Echoing Blade Skill Build's first anti-war and melee damage. This version is the most important attribute. The second strength is also great for Runeblade because Runeblade has a passive 70% power. Will be converted into intelligence. This is the new professional Runeblade in the current version of the PVE is suitable for the details of the recommendation. 1, the first Runeblade brush this mainstream attribute is to choose Storm Sigil reason is the damage maximization (the most handsome) so here mainly explain, Storm Sigil recommended point fully. 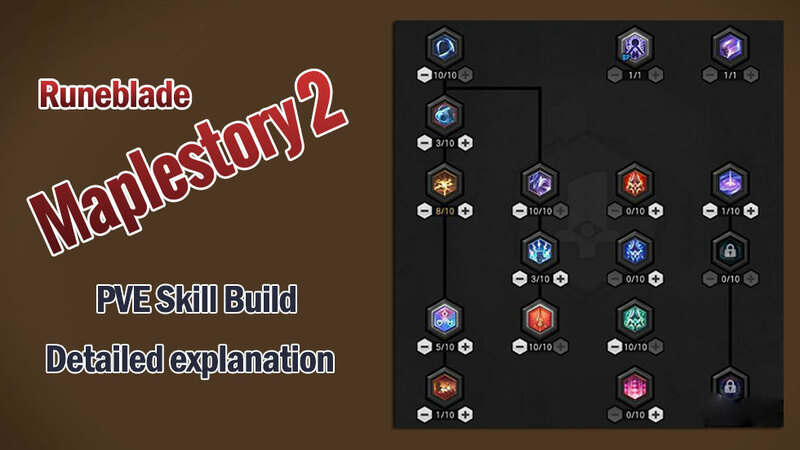 2, the following is to explain one of the main output skills: Flurry melee output moves, the advantages do not consume SP, in the absence of SP continuous output skills and damage is not low, can be cast in the jump, is also the main output even stroke cycle skills, recommended plus full. 4, the third Impact, melee main output skills each time the consumption of 45 SP and 7 seconds of CD time, this skill high damage belongs to the burst cooling only 7 seconds to unload the blue, CD is good to use, the level is not high Try to have as many points as possible when there are insufficient skill points. 5, Whirling Blades, remote main output skills consume 40 SP per application, no CD high damage, Storm Sigil can eject 4 surrounding enemies, Kill Small Monsters is very powerful to remove the main skills, penetrate The lightning current mainly outputs the cycling skill, which is also the skill that most players love today. The advantages of single-handed BOSS or Kill Small Monsters are considerable. 6, Blade Chasm, moving 7.5 meters to the front, the damage is good, but most players in the PVE use as displacement skills, recommend 1 point, you can also use Blink to do emergency displacement skills to move continuously to avoid damage. Blade Mastery is full of positive damage, no doubt! 8, Gravity Rune gathers strange (8 enemies) skills in the 3.75m range ahead, can add 1 point in 4 copies and part of the team copy when teaming out Small Monsters to teammates or use Whirling Blades to quickly clean up very practical. 9, Honing Runes, BUFF skills increase teammate crit damage within 3 minutes each point increased by 2% (only half of their own income), the cooling time is also 3 minutes is not recommended, later in the high level or according to team needs to learn this skill. 11, Warding Rune, active cast BUFF skills to increase their physical magic resistance, and with the use of different attribute drivers to obtain the corresponding attribute defense or additional benefits. 12, Elemental Potency, self-gain BUFF skills Each point increases its own attribute damage 2 points to cool 60 seconds, this skill with the priest's return to the blue array can maximize the damage output, but the current version of the skill points is insufficient, not recommended. PS: Frost Sigil and Flame Sigil have relatively low damage in the PVE brush (10 people chaotic copy shadow army altar can learn to switch to Kill Small Monsters), so it is not recommended to learn to add 1 point to switch. Runeblade skills are probably the same. For those who choose to choose defense and lightning damage flow jewelry, you can use Whirling Blades-Impact (7 seconds CD) to short SP in the shortest time, then Flurry continues to output and then automatically respond to SP and continue. Unload the blue loop output. The Echoing Blade partners can be exchanged with the Whirling Blades skill points. Jewelry can choose the attack speed and melee damage properties, so that the skill damage can be maximized. The output method is also to quickly unload the blue with Impact (7 seconds CD) → Echoing Blade. →Flurry continues to output continuously. Equipment selection weapon new exclusive Caterpillar knives, with passive starting BUFF gain is considerable and easy to trigger, the main attribute of the upper and lower clothes is the main hit leader injury, the helmet chooses the corner of Balkan or Caterpillar, the glove wears attributes The belt cloak can attack the speed, the latter can also add the leader injury, the shoes can choose to make up for the hit, the speed, the leader can be injured, the current version of the best stack to 94 or so is better.